Wild turtles living in temperate climates must avoid freezing temperatures in winter. 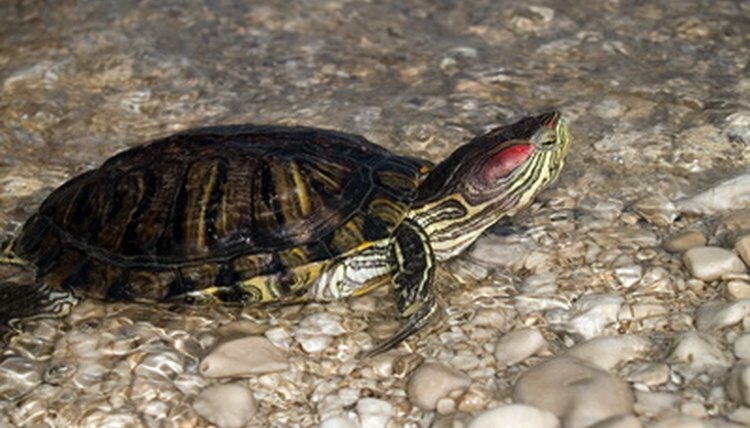 Terrestrial turtles and aquatic turtles differ in how they avoid sub-freezing temperatures. All wild, temperate climate species are inactive in winter. Tropical and marine species can be active year-round. Terrestrial turtles, such as box turtles, commonly dig beneath fallen leaves and into loose soil to overwinter. These animals spend the winter months motionless within the burrow, and they do not eat or drink during this time. Cool temperatures slow the animal's metabolism so their energy requirements are very low. Aquatic turtles such as painted turtles, sliders and snapping turtles overwinter beneath the water in ponds and rivers. These species typically burrow into soft mud on the bottom and remain there all winter. Cool temperature slows their metabolism so very little oxygen is needed. Limited oxygen may be absorbed through exposed mucous membranes in the mouth and throat. Turtles living in tropical and marine environments are not subjected to seasonal cold temperatures and, therefore, are active year-round. David Reber has been a published writer since 1991. His work has appeared in the Kansas Herpetological Society newsletter and in "Amphibian and Reptile Conservation." He teaches high-school science and maintains a menagerie of classroom animals. Reber holds a Bachelor of Science in biology from the University of Kansas and a Master of Science in education from Emporia State University.